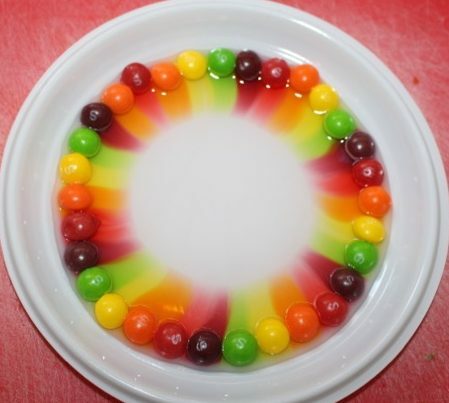 I kept seeing this Skittles experiment popping up on my Facebook feed. It was pretty simple, cheap, and quite entertaining. 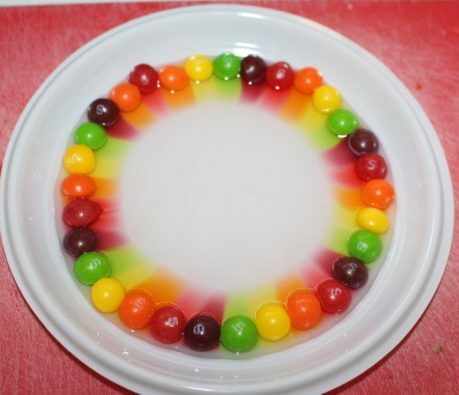 We just arranged Skittles around the edge of a small white plate and then added some water, until it was touching all of the Skittles. 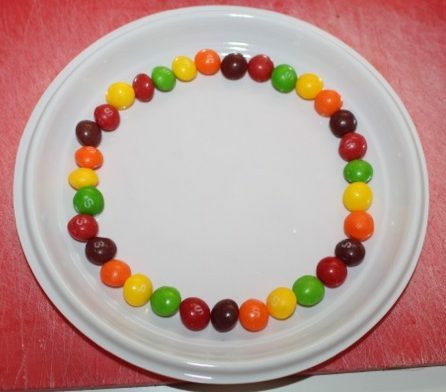 Over a period of a few minutes, the colours of the Skittles slowly bled towards the centre of the plate. If left long enough, the colours began to mix together. 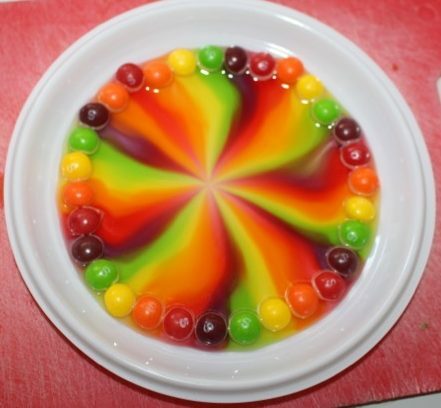 Most of our attempts ended with T1 or T2 shaking the plate and making the colours swirl together, or knocking the plate over completely. Luckily we had plenty of Skittles. You can see from the pictures that the centre of our colour wheel wasn’t quite at the centre of the plate. I think this happened because we were using a plastic plate and it didn’t sit completely flat. Almost meeting at the centre. 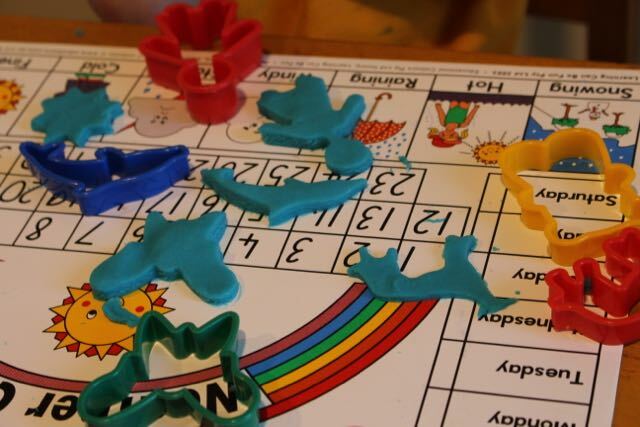 This was easily reproducible and the kids enjoyed doing it. They also ate the used Skittles once we were done! 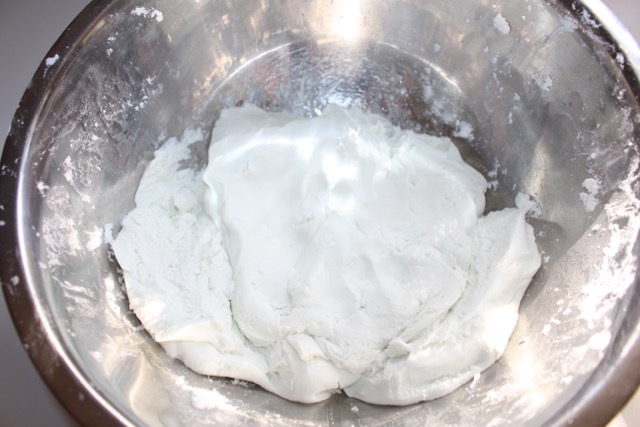 Over the holidays we tried a different kind of play dough at home, a very fragrant soft dough using only two ingredients. 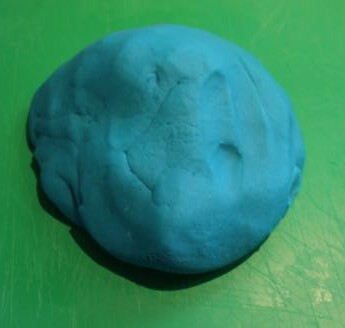 Now, I’m not sure where I saw or heard of this combination to make play dough originally, but a mum from playgroup had mentioned it recently, only not the quantities required, so we did a bit of trial and error. I used blueberry and coconut conditioner that we had in the bathroom (technically it was L’s, but it was the nicest smelling stuff we had at the time…) Oh, and it was a cheap conditioner despite the lovely smell, so it kept the cost of our little experiment down. 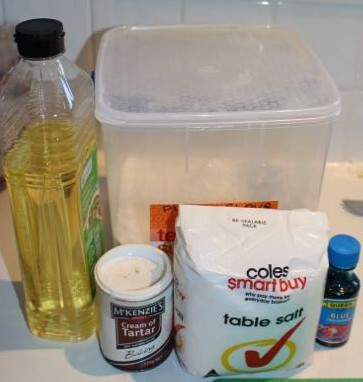 After mixing and adding and mixing some more, I came to the conclusion that the consistency was pretty good somewhere around one part conditioner to two parts cornflour. 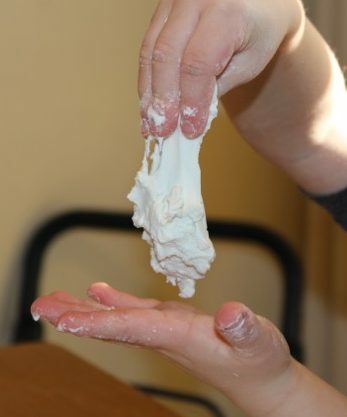 However, it still seemed a bit closer to slime than to dough, as it just wasn’t all that great at holding its shape. I did try adding more cornflour to the mix, but the boys declared they liked it as it was. I chose not to add any food colouring as the dough became a very pale blue from the colouring in the conditioner. Both boys enjoyed the sensory experience, of the touch and smell of the dough. They squeezed it, and poked it, rolled it in their hands and stretched it. I did have to stop T2 from playing with it after a while though because he kept eating it (despite many warnings and admonishments, and what I can only imagine was a terrible taste!) 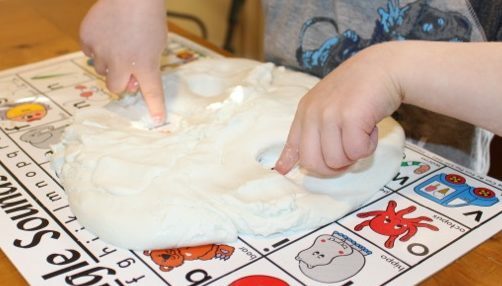 T1 continued to play with the dough for quite a while, fascinated at the way it felt and moved in his hands. It kept for a couple of days covered, but it was starting to dry out a little by then. 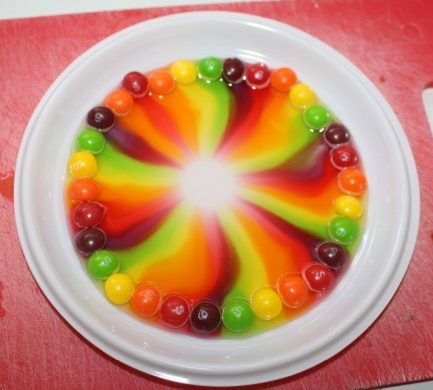 It was fun and easy to make, so we would probably make it again. 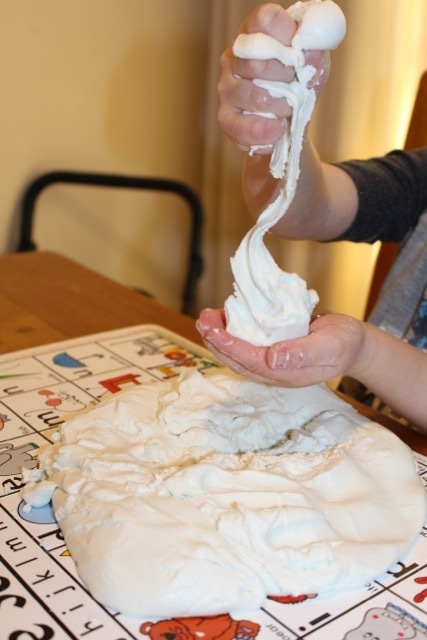 We love playing with slime, it’s just so much fun. Normally we just make up a tubful, using about half a kilo of cornflour plus water and food colouring. 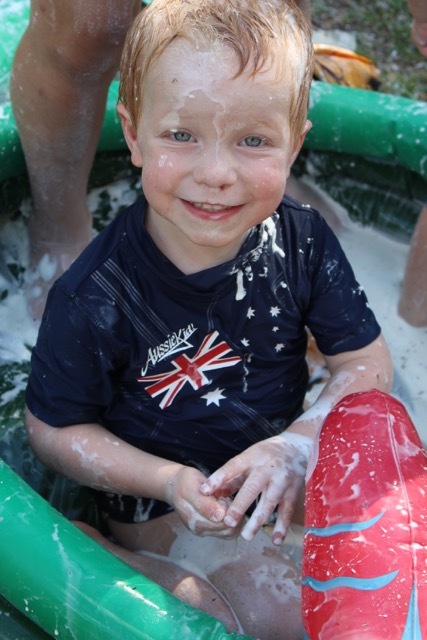 This time we used our blow-up drinks cooler (which looks like a small paddle pool), and we added about seven kilos of cornflour, plus water. If I’d had any more cornflour I would have used it! This was definitely an outside activity. All the kids put on their swimmers (and sunscreen), and then we got to it. 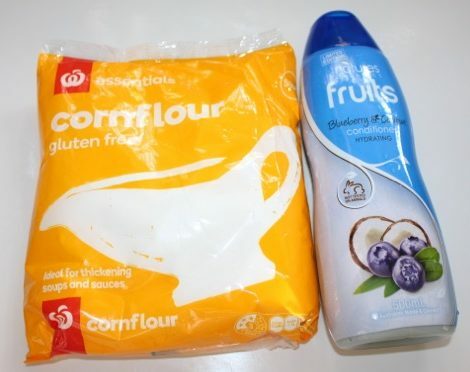 L and A helped me put all of the cornflour into the drinks cooler, and then I added some water and the kids mixed it all up. A got splattered with slime by her brothers. Predictably, the kids all got into the drinks cooler and sat, jumped and squished through the slime. At one point all four of them were in the cooler at the same time! They covered themselves and each other in slime, they mashed it between their fingers, and they “swam” in it. 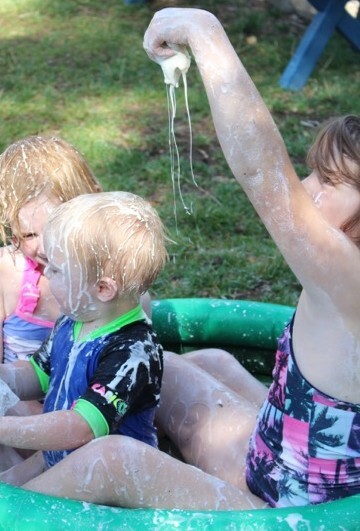 They love that the slime is both a liquid and a solid, pulling globs of it up into the air and then letting it drop and stream back down through their fingers. It was so thick in its solid state that the boys could actually stand on it and it supported them! This was a great way to spend a hot afternoon. We all had a lot of fun. At the end, everyone was hosed off in the yard, and then went inside to bathe. The slime comes off the skin quite easily in the water, but they all needed to wash it thoroughly out of their hair! Squishing slime through her toes. L letting slime drip from her fingers onto her brother. Shapes cut out of the dough. 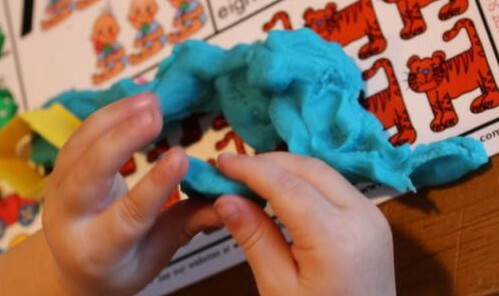 My kids all love playing with playdough, it is fun and great for fine motor skills and creativity. The toddlers have even mostly stopped trying to eat it now! 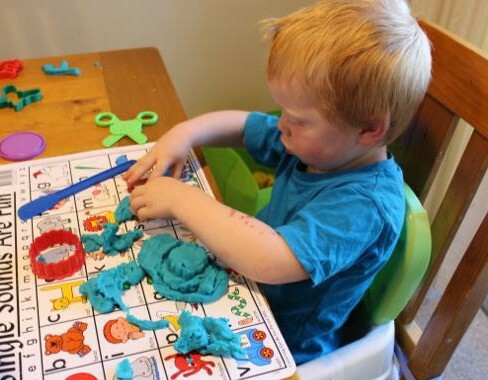 I prefer to make my own playdough as it is easy to make and cheaper than the store-bought products. I almost always have all the ingredients in the pantry too, so I can make it whenever we like. 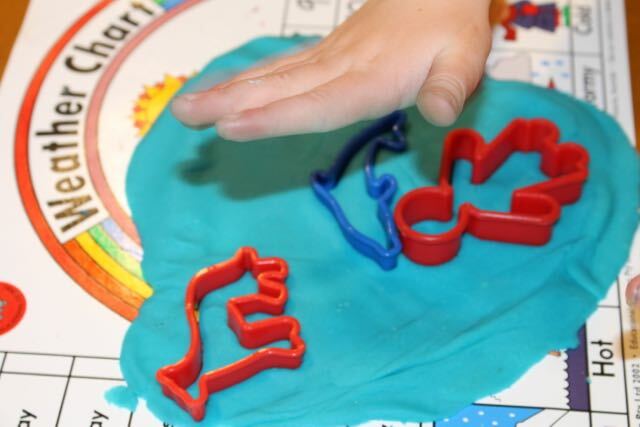 I’ve always felt that the playdough recipe on the side of the cream of tartar tin makes the best playdough. It needs to be cooked, but it is smooth, soft and long lasting every time. 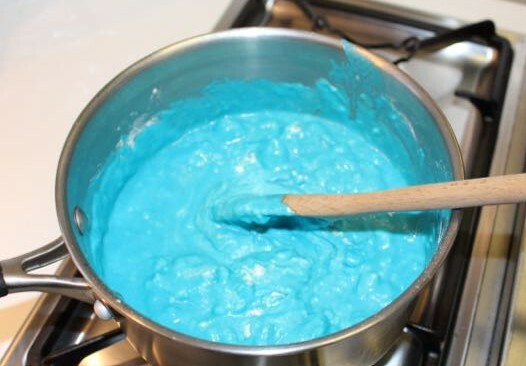 We added blue food colouring for the colour and vanilla essence to make it smell nice. A helped me to stir it in the saucepan until it began to clump together, then we turned it out onto a cutting board and kneaded it for a couple of minutes to make sure it was nice and smooth. Mixing all the ingredients in a saucepan. 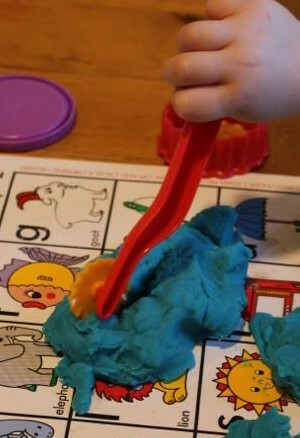 Once the playdough was ready, the lids sat up at the table to use it. They moulded it with their hands, cut out shapes with cookie cutters, and rolled it into balls and snakes. T2 enjoyed just squishing it between his fingers, while L made people models. A and T1 made lots and lots of cut-outs. They also used some plastic scissors to cut the dough, rollings pins to flatten it, and plastic rollers to make patterns on the dough. Fun was had by all! Using a roller in the dough. Once we were finished, I stored the playdough in an airtight container in the pantry for next time. Fluid Mechanics: A Fairy Tale by Sarah Allen, e-book, 21 pages, published in 2013. What an interesting concept! Learn about physics through the telling of a fairy tale. The first section of the book tells the fairy tale, while the second part goes over the physics concepts that were found within the story. 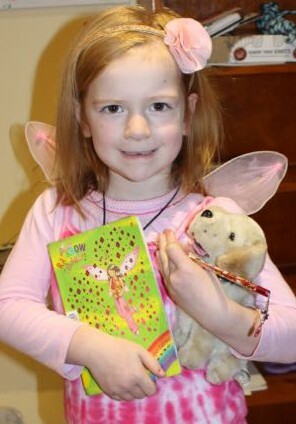 Once upon a time there was a princess… and she rocks! She becomes queen, and goes off to face the wizard that has stolen her baby daughter, and put her beloved husband into a never-ending sleep. Her husband’s brothers help her out in her quest, giving her a magical golden ball and a silver boat. The fairy tale showed the Archimedes’ Principle, Buoyancy Force, Bernoulli’s Principle and Archimedes’ screw in action. The story was well written, and I enjoyed it. I also liked the Queen, who shows innovation, perseverance and courage along her quest. She faced the wizard, and solved his conundrum, using fluid mechanics, allowing the reader to explore an example of these concepts. They were then explained more fully in the second section. Simple diagrams were used to help illustrate the physics. This is a great way to introduce physics to younger students, or anyone having difficulty getting their heads around it. I found it was quite easy to understand the science in this format, and it hardly seemed like learning at all! Suitable for kids from upper primary through high school and beyond, Fluid Mechanics: A Fairy Tale is a fantastic introduction to this interesting subject. More Sarah Allen science books are available through Amazon. 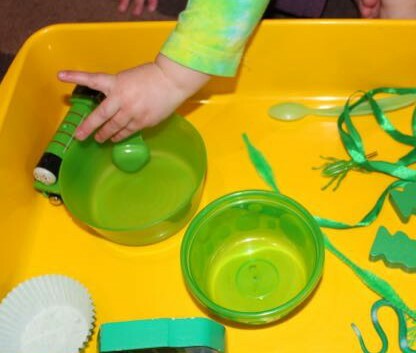 After gathering some green items together, we sat down to our green sensory tub. 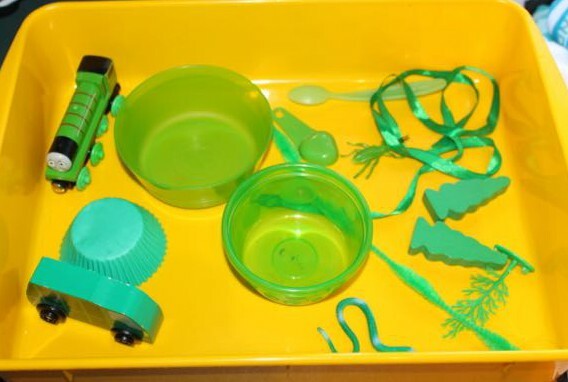 We had some ribbons, pipe cleaners, bowls, spoons, a toy train and a toy truck, muffin case, wooden and plastic trees and some green toy bugs and snakes. The boys were both very interested in the toy train and toy truck, rolling them all over the tub and the floor. They touched the fuzzy pipe cleaner, and used the spoons to scoop up the bugs. T1 tried to wear one of the bowls as a hat. T2 crinkled the muffin case, and fluttered the ribbon about his head. T2 had a lot of fun moving the snakes and bugs about, and using the spoons. He pretended to scoop food out of the bowls and eat it off the spoon. After a bit, T1 tossed all of our green items out of the tub and sat in the tub himself! We talked about the colour of his clothes, but he wasn’t wearing anything green! He liked repeating the word “green” after me, and finding things about the house that were also green. Making the snake ride the truck. 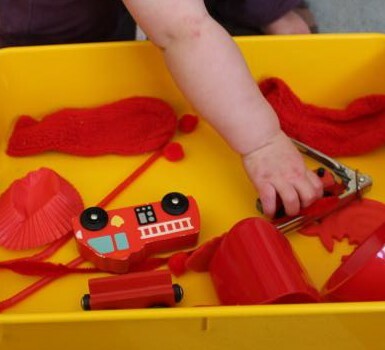 On a cold winter’s afternoon we pulled out our tub and filled it with red objects to create a sensory tub for the boys. 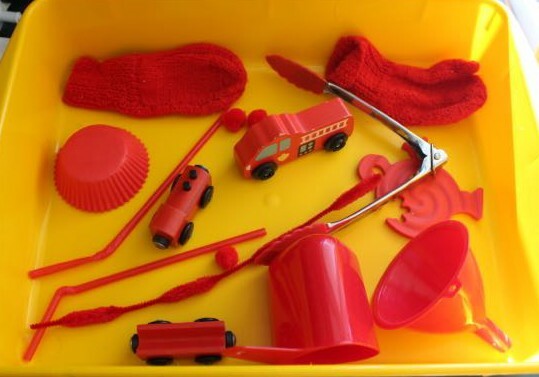 We had some straws, toy trains and a firetruck, tongs, a funnel and cup, pom poms and mittens. Going straight for the train! We explored the different textures of items within the tub. T1 kept putting the pom poms in his mouth, so I removed them before them could be swallowed! 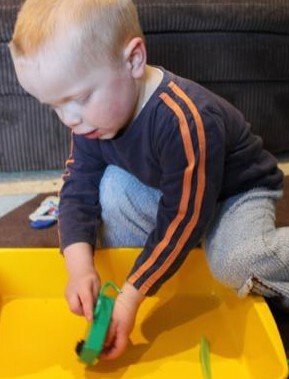 He also enjoyed touching the pipe cleaners and blowing through the straws. T2 liked the mittens, and rubbed them all over his face. He also tried putting them on his hands, and his feet. 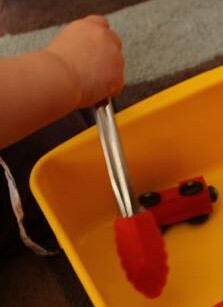 Trying to pick up the train with the tongs. They both loved playing with the trains and the firetruck. T2 tried to use the tongs to pick some of the other objects up, but without much success. 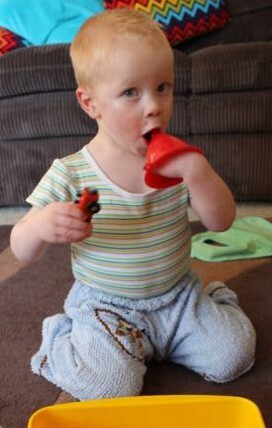 T1 used the funnel to make music by blowing through it like a horn. 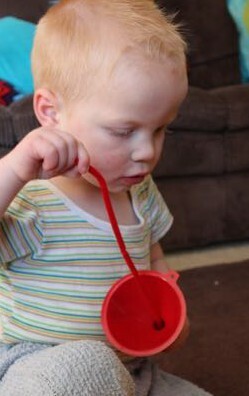 He also threaded one of the pipe cleaners through the funnel a number of times. Throughout the fun, we talked about the colour red, and I encouraged them to say it. I pointed out other things around the room that were red, and asked them if they knew anything else that was red. They both became very excited when I started talking about red fruits, such as strawberries, apples and raspberries. We had to go for a snack after that! Does anyone else remember rubbing your school shoes on the industrial school carpet until you’d built up enough charge to zap people? 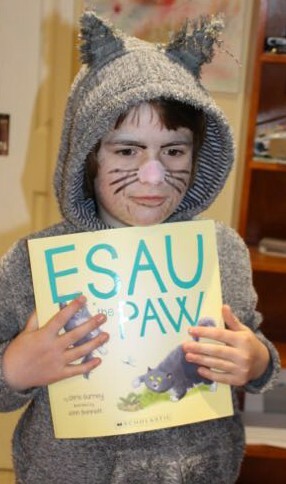 We spent many wet winter days stuck in a classroom doing this to each other! 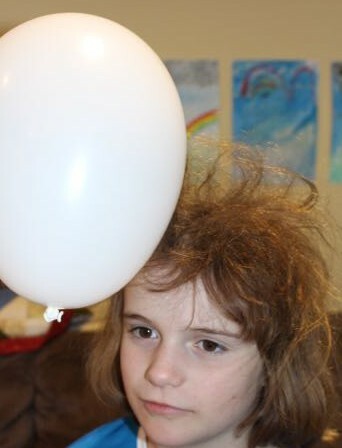 This is static electricity, and there are other ways to experience it, which are much better with the kids. 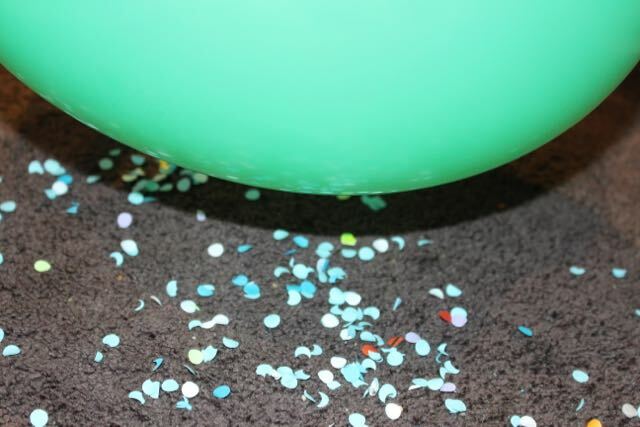 Static electricity is caused by friction between two surfaces. Some surfaces are better at building and maintaining a charge than others. We used a balloon for our experiments because it is easy to create the charge and to witness its effects. The friction causes the surface to gain a charge (negative or positive), and when another surface has the opposite charge, they become attracted. Static electricity can cause a ‘zap’ if you touch someone or something after building up some static on yourself. 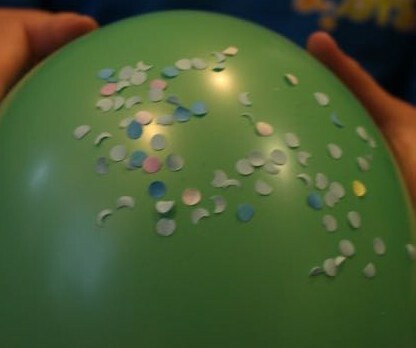 You can find a good explanation of static electricity at Science Made Simple. Rubbing the balloon on the rug. 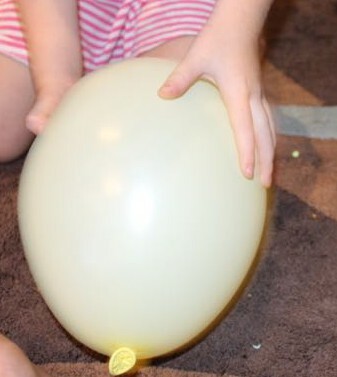 We used balloons to demonstrate and play with static electricity. I blew up a couple of balloons and gave one to each of the kids. 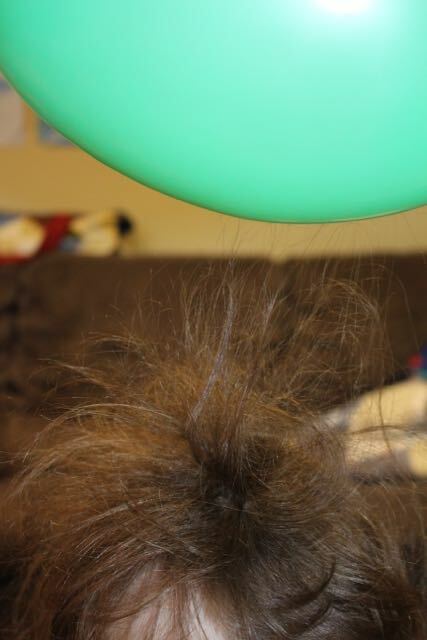 First they rubbed their balloons against their hair to build up the charge. When they raised the balloon away from their heads their hair was attracted back to the balloon, looking like it was standing on end. They also tried rubbing the balloons on the carpet, and on their clothes, but it didn’t provide enough charge to lift their hair. 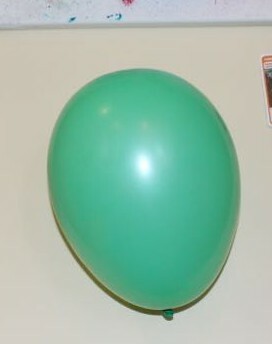 They discovered that after rubbing the balloons on their hair, there was enough charge to hold the balloon to the wall. They were amazed by this, and spent quite a lot of time trying this over and over. I emptied the hole punch onto the carpet (this can make a big mess, so be prepared to vacuum after, and ask a parent first!). All the little bits of paper from the hole punch scattered on the floor. The kids charged up their balloons and then attempted to pick up these bits of paper. They tried picking up the paper from different heights to see how far away the balloon could be before it lost its attraction. They marveled as they watched the paper fly up to stick to the balloon. Lifting paper off the floor. Paper stuck to the balloon. They discovered that they could get the best reaction by rubbing the balloons on their head, though this did cause their hair to become rather knotty after a while. We had to carefully brush their hair out at the end, but they had a brilliant time playing with the balloons. We also discussed some other places that we might encounter static electricity zaps, such as on the trampoline and the slide.